Sault Ste. Marie’s Four Season Outdoor Adventure Store. Conveniently Located Downtown Sault Ste. Marie on Queen Street, just off the International Bridge is a one-stop shop for all your outdoor needs. 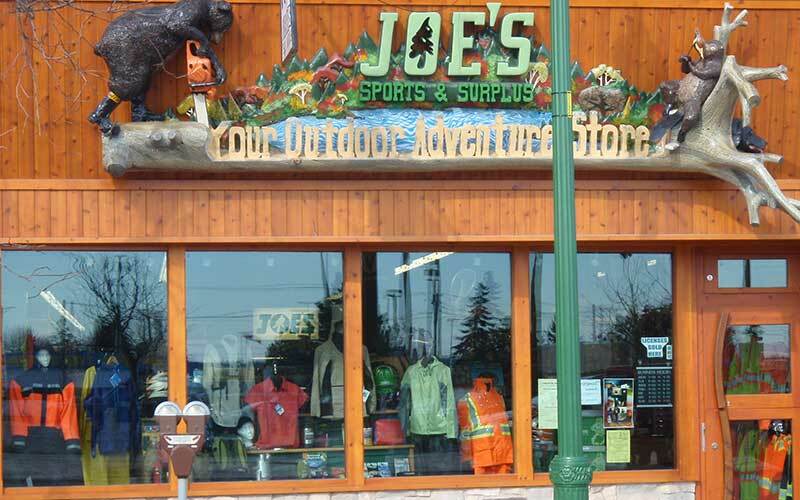 With a huge selection of quality camping gear, apparel and footwear Joe’s will make sure you have everything you need to make your next camping trip a success. As the leaves begin to fall and it’s time to Gear up for hunting Joe’s can offer you the Sault’s largest selection of hunting apparel. From boots and socks to waterproof/breathable outerwear in Camouflage and Hunter Orange. When the Snow arrives and it’s time to hit the trails come see us for a great selection of Snowsuits, snowmobile helmets and snowshoes for the whole family along with winter boots, toques and mitts. Quality Products, Great Prices and Amazing Service have kept us Outfitting the Sault for over fifty years.